While vacationing at the beach, I picked up a great new recipe from one of my parent’s wonderful friends, Ms. P. She showed me a simple way to make a great grilled onion side dish when firing up the barbecue. I have prepared that grilled onion side several times since with tasty results. Peel outer skin off of onion. Remove one end of onion. Slice onion 3/4th of way down (Not all the way as you want onion to partially stay together) as if dividing in half. Do the same thing lengthwise. Make one more cut across diagonally. Pieces of onion will start to fan out, but be held together at the bottom. Cut Bouillon Cube into small pieces and sprinkle throughout the onion. Slice up butter in small pats and insert into slits throughout the onion. Completely wrap onion in Reynolds Wrap with ends of foil gathered together at top of bundle. Place wrapped bundle on grill, off to the side of direct flame, and let cook at 400 degrees to 430 degrees for about 25 minutes. Grill time may vary by height of flame and individual grill performance. What you are looking for to know the onions are done is that they are soft to the fork touch throughout. Once fully grilled, you may want to stir bouillon and butter sauce throughout the onion, distributing any last bits of bouillon in mixture evenly. Reynold Wrap Aluminum Foil for covering. Remove one end of onion. Slice onion 3/4th of way down (Not all the way as you want onion to partially stay together) as if dividing in half. Do the same thing lengthwise. Make one more cut across diagonally. Pieces of onion will start to fan out, but be held together at the bottom. Cut Bouillon Cube into small pieces and sprinkle throughout the onion. Slice up butter in small pats and insert into slits throughout the onion. 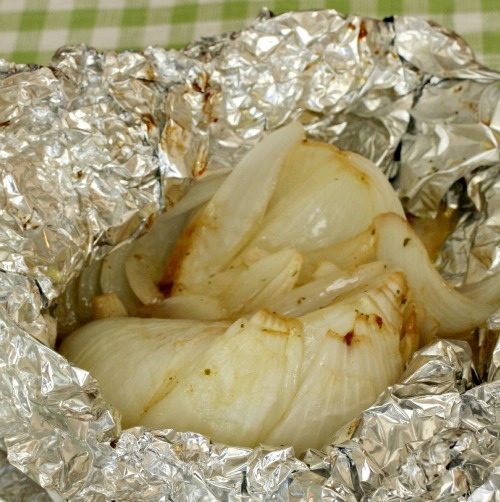 Completely wrap onion in Reynolds Wrap with ends of foil gathered together at top of bundle. What you are looking for to know the onions are done is that they are soft to the fork touch throughout. Once fully grilled, you may want to stir bouillon and butter sauce throughout the onion, distributing any last bits of bouillon in mixture evenly. My son would absolutely LOVE this! He will eat onions raw or cooked, all the way through. Sounds delicious! Thanks for sharing with Creative Style! The simpler the better I usually say. Thanks for sharing. I found your recipe over at Turn it Up Tuesday. I host Tickle My Tastebuds Tuesday and would love it if you would come over and share this recipe. I’m sure our party goers would love it! Here is the link http://bit.ly/1qcBRGv. Have a wonderful day! Thanks so much. Sending some G+ love your way. I picture this to be almost like French onion soup in a foil pack. Yum! Thank you for sharing. Next time we fire up the grill, I’m tossing these on it! Yes, the onions definitely have that soft, juicy french onion quality. huh. i saw this featured at pinworthy projects, and i think i’ll have to try it. thanks! The Grilled Onions are definitely so easy to make. Sending some Pinterest love your way. I’ve done this before but when I cut the top off the onion, I carve out a well and fill it with butter and push the bouillon cube into the butter. I then wrap the onion tightly and place in the coals. When we unwrap them, we put them in a bowl so we don’t lose any buttery goodness. Makes a great dip for steak! Dip for steak is such a great idea.